Minneapolis Marathon 2014 Race Recap & National Running Day! Happy National Running Day! I hope you all celebrate by lacing up your shoes and getting out there for a run – whether it’s for 3 minutes, 3 miles, or 3 hours! I’ll be putting in my first miles after this past Sunday’s race and I can’t wait to get back out there. Sunday’s race – the Minneapolis Marathon. Ah, so much drama. Long story short – the Minneapolis Marathon got cancelled, but Adam’s Birthday Marathon went on as planned. The whole story: A group of seven of us traveled to Minneapolis on Saturday for the race. Three runners (Adam, the birthday boy, and I planned on running the full, Ash the half) and four amazing cheerleaders. As soon as we crossed the state line, the rain started. It wasn’t bad and we hoped that the rain that was predicted for race day was just coming in early. The race expo was a bit unorganized and not very helpful at all. I was surprised to find out that they did not have any course maps available at the expo and the gal at the booth told us instead to just look at it online. Sure, that might have worked… had their PDF been readable. You could see the general outline of the course, but the street names were indiscernible. I mean, how the heck is something like this supposed to be useful to people who aren’t familiar with the area? During the time at the expo, the light rain developed into a down pour and it just got worse from there. (Side note – the views from our 14th floor hotel room were amazing!) The Team Ortho (TO) / Minneapolis Marathon race staff sent out an email late Saturday night reminding us to hydrate (a little late, but thanks) and to keep an eye out on their Facebook page for updates at 4:00 AM, 5:00 AM, 5:30 AM, and 6:00 AM. We dutifully woke up at 4:30 to eat and prep for the 6:30 race start. When we got up, the weather did not look promising – heavy storms with lightning galore. I obsessively started checking the race’s Facebook page for the promised updates that were to be posted at 4:00, 5:00, 5:30 and 6:00. There was no 4:00 or 5:00 update. At 5:26, they finally posted an update saying that the start time had been postponed an hour to 7:30 AM. At 5:29, they posted again saying the next update would be at 7:00 AM. Ok, so no other updates until 7:00 AM. I guess I could deal. We waited around the hotel until 6:30 before dragging ourselves out into the rain to the race start line. Runners were huddled under any shelter they could find. The rain finally let up a little and the runners made their way up to the start. 7:00 AM came and went with no update from the marathon organizers. No one seemed to have any idea what was going on. 7:15 AM and still no updates. Everyone figured the race would start, as scheduled, at 7:30 AM. Then, 7:30 AM passed and the race didn’t start. People started checking Facebook – no updates on there, either. Race staff was nowhere to be found. 7:40 AM. Nothing. 7:50 AM runners start walking back to their cars and the word spreads that the race has been cancelled. (For what it’s worth, a Facebook update was finally posted at around 8:00 AM). I found Adam and Ash and we decided we were going to run it anyway. We had spent months training and we were already there. I decided to run the half with Ash instead of attempting the full and the birthday boy set off, determined to finish the full. As we and a couple hundred (?) 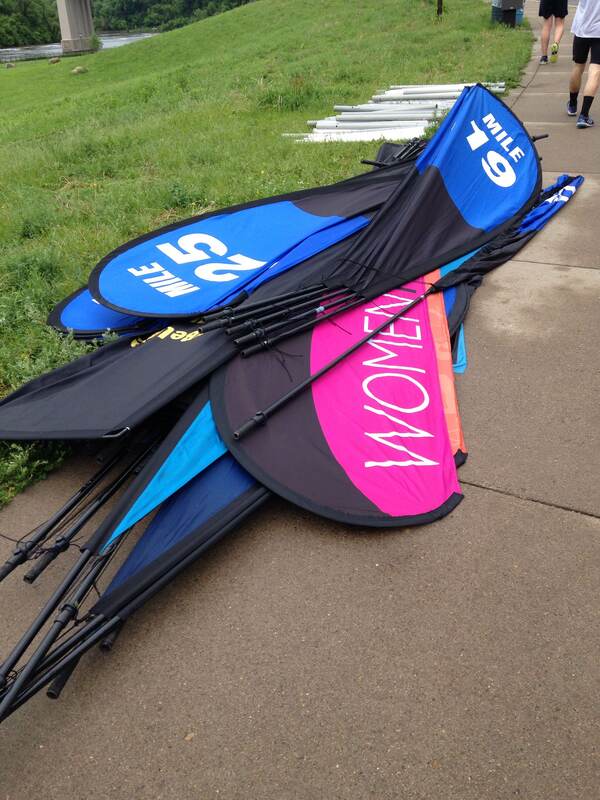 other rogue runners went around the barricaded start line, race staff told us that we were running at our own risk. We blew past them. It wasn’t raining. The weather apps showed no storm headed this way. Heat, humidity, and an unfamiliar city were our only challenges. A few miles later, a staff member was on the route, screaming at us to remove our bibs or the police would take action. What the heck? Ash and I dutifully flipped our bibs over and continued on. As we ran, we watched the race staff pull mile markers, cones, and tightly wrap up the water stations in plastic wrap so that runners couldn’t get to it. When we finally reaches the finish line (or what was supposed to be the finish line), we found a volunteer handing out medals. Wait. I thought the race was cancelled. Why were they handing out medals? I grabbed one, started stretching, and took in my surroundings. I saw many confused, lost race participants. Some were wondering where to pick up their gear check bags. Others were wondering how they were going to get back to the start (since the shuttles had been called off). The TO staff and volunteers had no answers. They busied themselves with packing everything up and seemed to care very little about answering any questions that the race participants had. Mike, Ash, and I met up with three others in our group to cheer on the birthday boy marathoner. A group of us ended up running the last 3.5 miles with him. When we finally made it to the finish, the lot was deserted – no sign that there was a race planned for that day. I want to make it clear that I 100% understand why the race was called off. The race organizers thought that there was going to be another severe storm with lightning passing through and didn’t want to risk the lives of the runners or volunteers. What I do not understand is why the race cancellation wasn’t announced and why the updates weren’t posted to Facebook as promised. The disorganization and lack of communication of Team Ortho and their Minneapolis Marathon were dismal. Tuesday afternoon, TO and MM slightly redeemed themselves by sending out an apology and discount codes for other races they put on, including the 2015 Minneapolis Marathon. Will I run another one of their races? I’m undecided. The course (or what I think was the course) was absolutely beautiful and I would love to run it again, but this experience as a whole was so disappointing. Categories: Life Outside of Cooking, Run | Tags: life outside of cooking, run, running | Permalink.